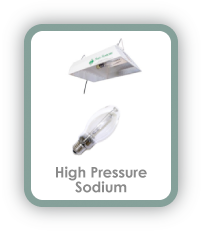 Provides optimal light in the spectra that plants need most for efficient and healthy growth. Incredible uniformity of light distribution over the plant grow area, eliminating hot and cold spots that inhibit uniform growth. Designed to produce much better plant growth while using less wattage than competitive technologies. Environmentally friendly Solid State Lighting Technology. (No heavy metal vapors, HAZMAT materials or neuro-toxins). Contains no moving parts to eliminate noise vibration and maintenance. CLICK THE ICONS BELOW to compare other lighting technologies to the superior performance of SSVL. High Pressure Sodium bulbs generate predominantly green, yellow and orange emission peaks (based on the emission spectra of the elements inside). Contains heavy metal vapors and toxic materials, which commonly include mercury and lead. As bulbs reach end-of-life, they can require more electricity to produce less light. Up to 50% of bulbs may burn out before they reach their lifetime hours rating. Long warm-up periods can waste up to 15 minutes of energy consumption per light when first powered. BLUE: The minimal blue light generation (400-499nm) means that the photomorphogenic responses controlling plant shape and many important pigments, such as antioxidant anthocyanins and coloration pigments, are not well stimulated. GREEN/YELLOW: Most HPS output is in the green-yellow spectral region. This is a very inefficient region for plants when compared to blue and especially orange-red light, resulting in wasted energy. RED: The minimal output in the red spectrum results in inefficient overall growth-stimulating light output. are optimized for human vision, not plant growth.